Rambaldi, son of Rip Van Winkle was having his fourth career start when carrying the purple and yellow silks of his owner Abbas Alalawi to victory. 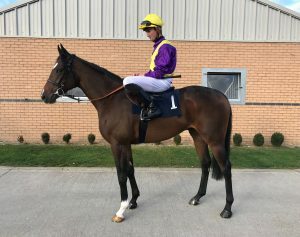 Marc Monaghan gave the two year old a perfectly executed ride to land the 32Red Casino Nursery Handicap at Kempton Park on Thursday. The gelding was held up in the first part of the race and started to make smooth progress under hands and heels over 2f out before being ridden and quickened up well to chase leader and staying on strongly inside the final furlong beating the second placed horse Dancing Jo on the line. Rambaldi has come out of the race well and we are delighted to have given his owner Abbas Alalawi his first winner in his silks.